Fiber Art Options: Twelve by Twelve Book Review - A Charmer!! Twelve by Twelve Book Review - A Charmer!! 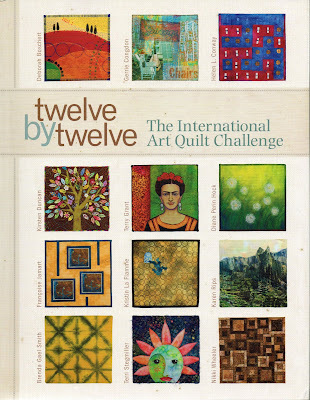 This delightful art quilt book was sent to me by Lark Books to review. What a pleasure that is! I love books, especially when they are interesting, tell me something I want to know, and are written by people who have a new experience to share and share it well. The concept for the book is simple, 12 people each came up with a different theme for a 12" x 12" quilt series, such as: Shelter, Illumination, Water, Identity. Then each person interpreted the theme in her own way, resulting in 144 different small quilts with unique styles and concepts for 12 themes. For each theme, the artists had 2 months to create and reveal their artwork to each other. In the two years of doing the challenges, the twelve women from three different continents, got to know each other well and formed on-line friendships. Since beginning they have each gotten to meet at least one of member of the Twelve. While the concept is simple, the execution is excellent and the resulting book that documents their two-year quilt adventure is a highly engaging book that can be read quickly or slowly for more depth. Each of the twelve themes is laid out in a chapter, with one of the Twelve writing about her experience and often telling a bit about the others' experiences as well. Each person writes a brief note about her quilt on the theme. Photos for each of the pieces makes the book rich. In addition, there is information on how to form a challenge group, even an international one. And lots of tips along the way. I wanted to wait until I had read the book entirely, but it has become my favorite bedside book for slow reading and absorbing. So this review is based on a overview of the layout of the book and a careful reading of the first three chapters (themes). The book is a delight. I recommend it heartily. I am so eager to get this book, Nancy... it includes some of my favorite fiber artists. Thanks for the review. Such a simple idea and such complex results. I had just learned of this book from a friend. Thank you for your comments it looks like a great read. I would love to receive a copy of this book. Thanks so much for the opportunity. Your review makes it all the more compelling to read! Didn't know what this challenge was about but your review makes me want to read about it. Very intriguing concept. Would love to own it.